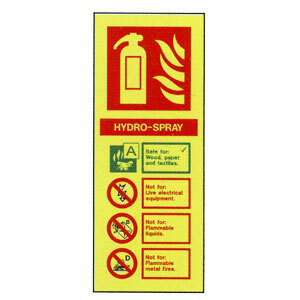 Photoluminescent ID sign in rigid PVC or self adhesive vinyl for mounting above a Hydro Spray (Water Additive) Fire Extinguisher in order to comply with the fire safety order 2005. Rigid PVC sign easily attached to a wall with either sticky pads, double sided tape or any no-nails type product. Vinyl version is self adhesive. Sign marks the location of fire fighting equipment 24 hours a day and explains how to use the equipment in a simple graphical way. Complies with classes from BS EN3-5.